Located right on one of Roatan's most beautiful beaches, Sueno del Mar Diving Resort offers everything you want for your diving vacation on Roatan. We are walking distance to all of West End's great restaurants, shopping, and entertainment. Our fabulous air conditioned accommodations have decks overlooking our beach and the Caribbean Sea with fabulous sunset views. Our tastefully decorated rooms include amenities to make your stay with Sueno del Mar comfortable and convenient. Our location at the western end of West End Village is quiet, yet close to shopping, dining, and entertainment. 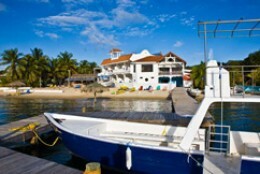 Sueno del Mar diving packages are available with your Roatan West End Hotel room.